The Secret to Macy’s Success? Whether you shop at Macy’s or eschew national chains in favor of local flavor, the work that this massive department store is doing to renovate and reposition their flagship store in Herald Square offers a number of lessons for commercial district practitioners. A $400 million dollar renovation coincides with some changing on the ground dynamics, including more tourism from Brazil and Asia and high end competitors like Nordstrom entering the market and grabbing those high end dollars. With that said, I really enjoyed this recent piece in the NY Times (“For Macy’s, A Makeover on 34th Street”, 10/1) which covered a number of basic concepts that we frequently use in our work. The most important concept they discussed was the need to dig deep and really understand your customer, and then tailor your merchandise and price points to fit those preferences. In fact, market research is the framework upon which much of this $400 million reinvestment is being made. At Macy’s, knowing their customer means stocking a wider variety of black leather tote bags in recognition of the larger number of office workers who work in midtown. Or offering Asian tourists more options in smaller sizes. Or finding ways to offer foreign tourists looking for prestige “American” brands the things that they want. In practice that means carrying more Ralph Lauren Polo, Tommy Hilfiger and Michael Kors, all classic American clothing brands. And while they are going upscale to meet these customer’s expectations, they haven’t given up on price conscious customers. Macy’s continues to offer coupons in weekend circulars. 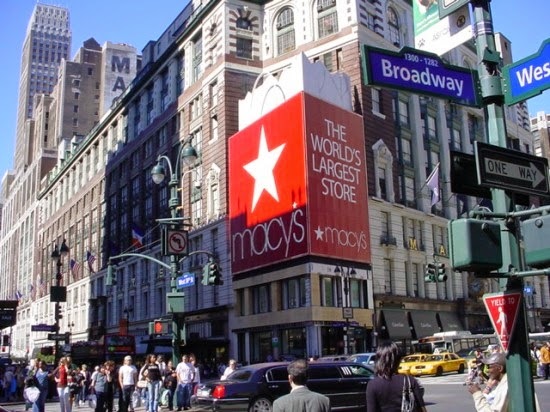 With 2.2 million square feet Macy’s is a shopping district onto itself, in fact, if it were a shopping center it would be classified not simply as a mall, but a “Super-Regional Mall” (which average 1.2 million square feet – so this Macy’s beats that average by nearly double!). This means that there are many stores within the store – and each seeks to meet the needs of customer with very specific expectations around price points and merchandise mix. This is why you can go to the shoe section (larger than a football field!) and find black boots differentiated by price and brand, ranging from $69 dollars to $229 to $1,160. Truly a store that offers a little bit of something for the customers that it already has and wants more of.